What Is Rapid Weight Gain? Rapid weight gain has many causes, including hormonal changes, medication side effects and lifestyle changes. Even when trying to gain weight, a gain of more than one to two pounds a week is considered rapid and may be cause for concern. As you age, your metabolism naturally slows down, which can cause weight gain if you do not change your calorie intake accordingly. For women, menopause changes hormone levels and significantly lowers your metabolism, often causing weight gain. Other hormonal causes of weight gain include Cushing syndrome, hypothyroidism, and polycystic ovary syndrome. In some cases, an increase in exercise or a dietary change can slow or reverse this weight gain. Multiple medications cause weight gain, including corticosteroids and drugs used to treat depressive disorders. Other medications may cause weight gain as a side effect. However, in some cases, weight gain may be caused by a fluid buildup in the tissues, which can signal a serious condition. Consult with a doctor in cases of rapid weight gain. 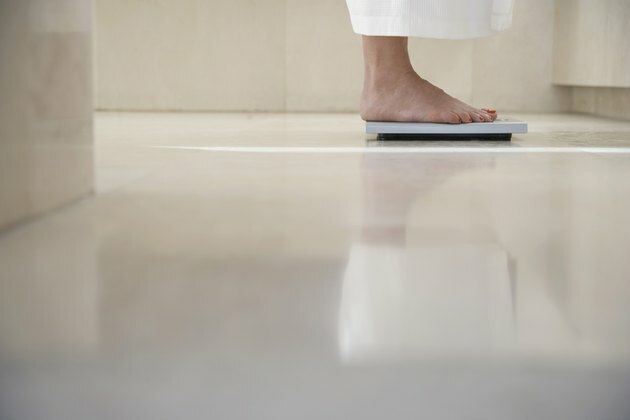 If your goal is to gain weight, you may be worried about gaining weight too rapidly. A healthy weight gain is approximately one to two pounds a week, achieved by increasing your calorie intake by about 500 calories a day. Gains of greater than two pounds per week may be a sign of excess calories or any of the previous factors mentioned. Why Does Your Heart Rate Go Up?